I've put a hold on making the altered playing cards for swaps, despite still making altered cards as one of my personal weekly tasks. 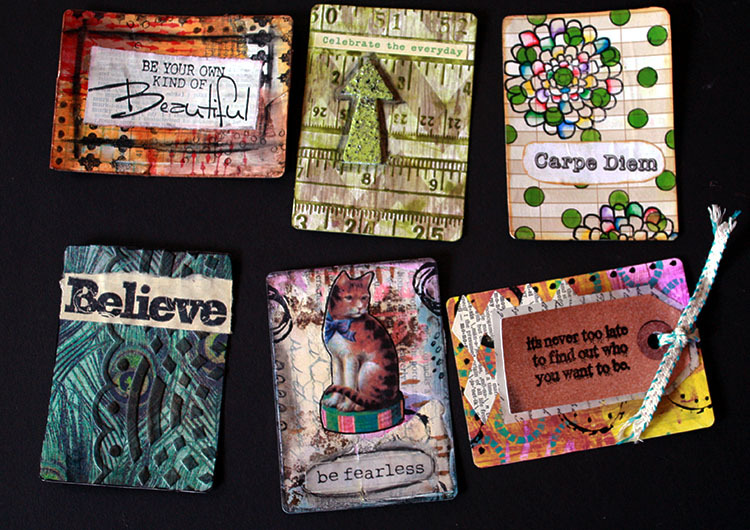 However, I've got a backlog of process videos that I recorded of the swap cards I did make. Since I'm trying to only upload videos while we sleep, I've been forgetting to start the uploads before bed. I succeeded the other night in remembering to get November's cards uploaded. Here are the links to Video 1 and Video 2, but you can also view them at the end of the post. Here's a look at the cards I made. That's the whole bunch of them. 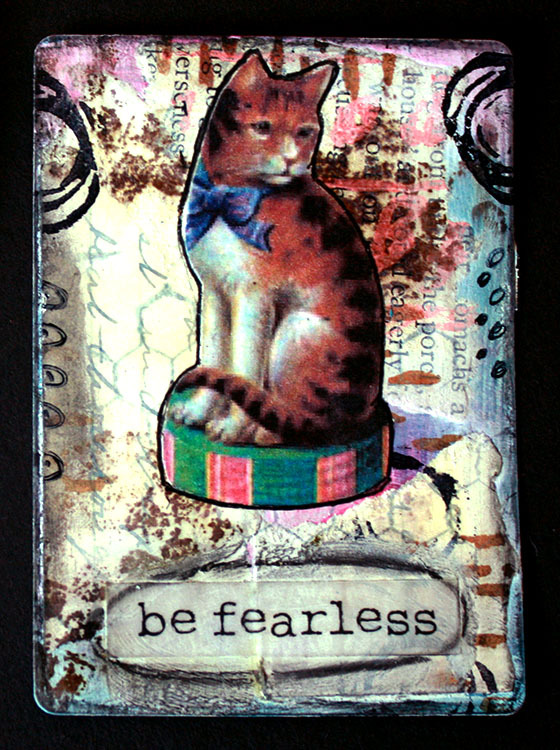 Card one was a simple layering of collage papers, paint, stencils, and stamps for the background. The focal is a stamp on some whitewashed dictionary paper with a stabilo all pencil frame and a few doodles. The second card came together fairly easily. 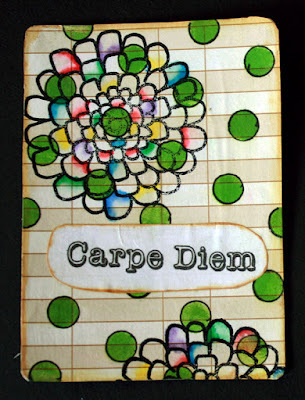 The background was made with embossed scrapbook paper accented with distress ink. A grungeboard arrow was altered with Iced Enamels and sealed, and a simple motivational phrase sticker was added to the top of the card. Card three was a lot of fun to make. Some paper from a shipping slip was glued to the card. The dots were made and outlined from a stencil. 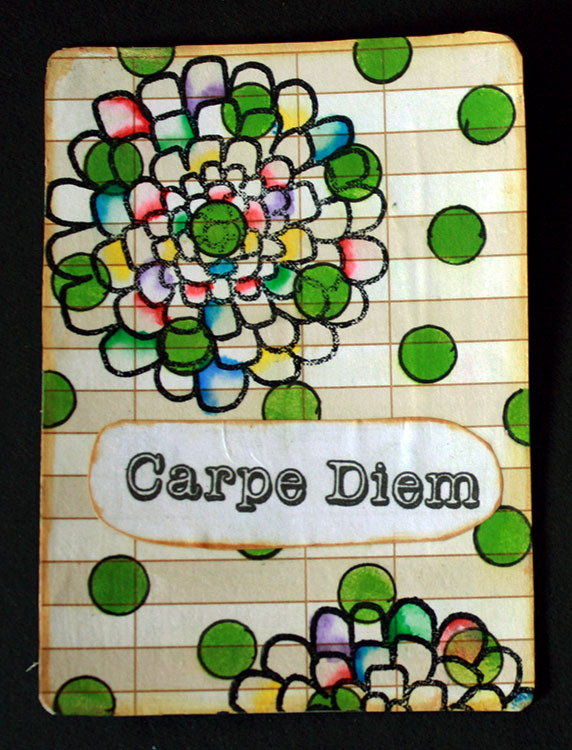 The flowers are a Rae Messigman stamp that I accented with watercolor markers and a water brush. For the motivational phrase, I used one I had printed on plain copy paper. The card and phrase are accented with distress ink around the outside. This fourth card was my partner's favorite. I have to say I'm partial to it as well. 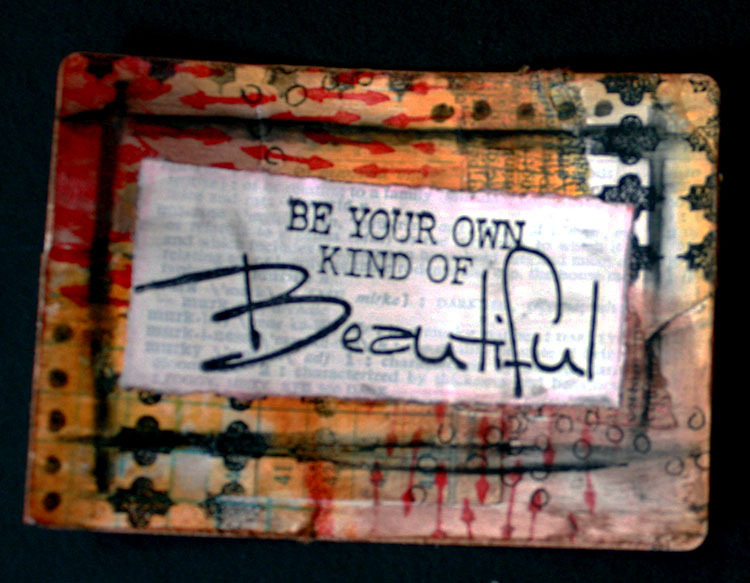 The background is layers of collage papers, gesso, stamps, and doodles. I found the cat image from a Dover free sample and the words were a clear sticker. 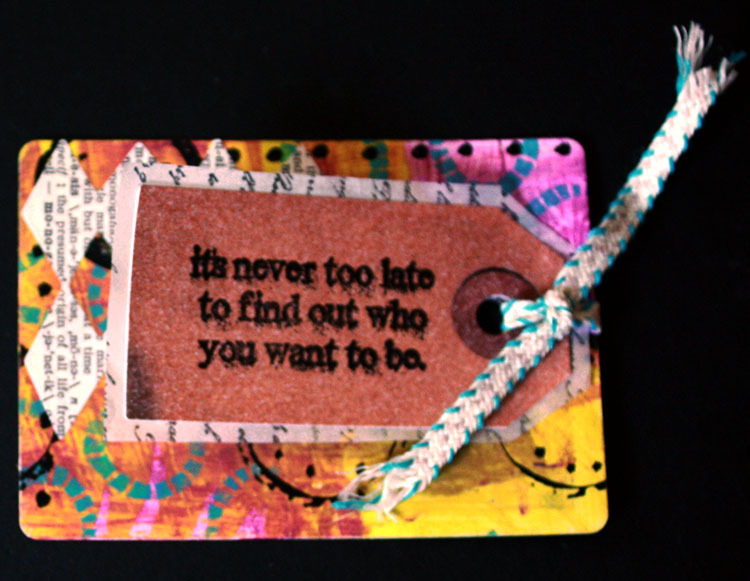 Charcoal was used to circle the words and accent the outer edge of the card. The fifth card probably had more steps than were necessary for such a simple result (you'll see in the video). 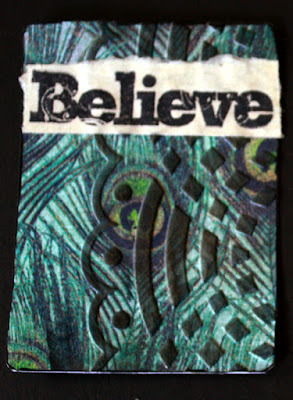 Embossed scrapbook paper was rubbed down with several layers/colors of ink. The word is a stamp placed on some yellowed paper. The edges were darkened, and that was it. Finally, the sixth card was a cluster of not-sure-what-to-do. 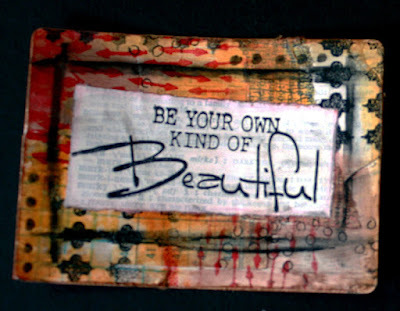 It started with some bright paint, stencils, and stamps. Black circles and dots were added before a harlequin cut out was glued down. 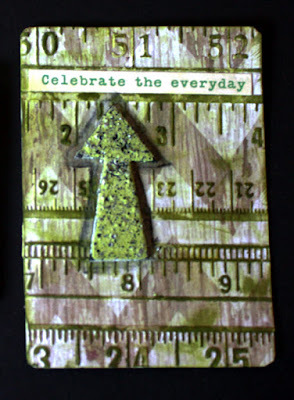 I stamped the phrase from a Tim Holtz stamp set onto a tag sticker. 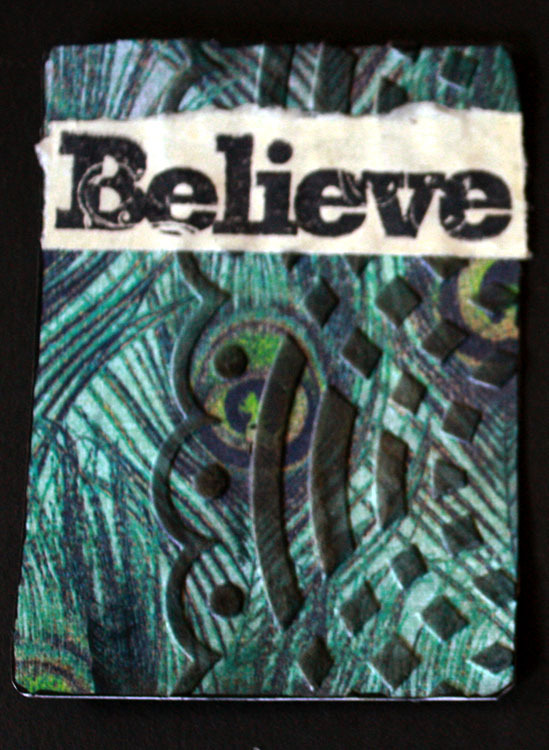 That sticker was glued to some stamped deli paper and tied on with ribbon before I called it done. Anyway, here are the videos for the full details. Oh, and these two videos are my first two attempts at doing voice-overs. They are kinda quiet, so you may want to turn your volume up a bit. And, here's the second one. This one's a bit louder than the first, but not much. I hope you like my process. despite some struggles with making these and getting them up.